Storytelling is the fastest way to engage attention and implement change. It works in a very powerful way with the brain of the listener to engage attention. It activates all of the senses. It is logical and linear, but it is also creative and nonlinear. Doug Stevenson, founder and president of Story Theater International, a speaking, training and consulting company based in Tucson, Arizona, found over the years with all of his clients that they all have one challenge in common – too much content, too much data, too much information, but not enough emotional connection. Doug shares how you can tell disruptive stories to engage attention. He also talks about the phrase that pays, and outlines the nine steps of story structure. My guest is Doug Stevenson. I met Doug in 1994 when he was making the transition from being in real estate to being a professional speaker centered around storytelling. Doug has had quite an interesting journey. He was the original Danny Zuko in the first performance of Grease in Chicago. He went to Hollywood and he attempted to become an actor. He learned a lot about Hollywood, but what he learned most was how to tell stories. 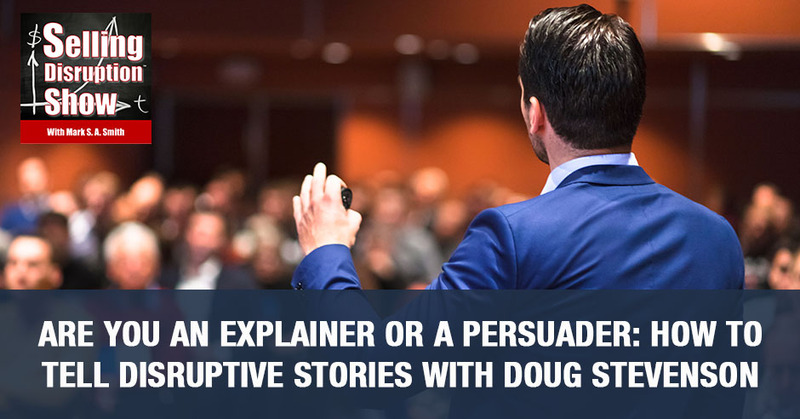 I’ve invited Doug to be on the show to help our reader understand how to use stories to impact their disruption because stories are the fastest way to implement change. Welcome, Doug Stevenson. Thank you very much, Mark. It’s a pleasure to be with you and your wonderful audience. Let’s talk about storytelling as an executive tool. What have you learned? What I say is emotion is the fast lane to the brain. You must make an emotional connection. Your content, your data won’t do that. First, you need to create a context for your content. That’s what story does. The story creates the why and the what? The content, the data is the how, how to, how it works, how we’re going to move forward. If all you talk about is how things work, instructions, data, you lose people’s attention. You don’t engage them. You don’t hold onto them. It’s all about engagement and story seems to be that fascinating communication vehicle that does that well. Not at all. It doesn’t do it. How do we create that context for our content? What’s the approach that you suggest that we consider? What we start out with is what are you trying to accomplish? What is the pain? What is the objection? What is the pushback? We identify either a personal or a corporate story to do that. Then we work on crafting of the story in a way because most people don’t understand how to use a story correctly. It’s an amazing tool. They say, “Doug, I’m telling stories.” For instance, I had this one guy called me up. He said, “I think I need your help because I’m telling stories, but they’re not working. I’m doing these presentations in hotels. I’m telling stories. The economy got bad. I’m forced to do these hotel presentations and I tell stories, but they don’t work. What am I missing?” I said, “What you’re missing is the strategy and the emotional connection.” I worked with him for two hours on a specific strategy. Disruptive Stories: Story is a fascinating communication vehicle that creates engagement. He came to me with a 1% closing ratio. He had 200 people attend these hotel presentations. He had gotten two customers. He went out after I worked with him for two hours. He did the presentation with the three stories and three calls to action. He got a 40% closing ratio. It was the difference between, “I’m telling stories, but I don’t know what I’m doing. I don’t have a craft. 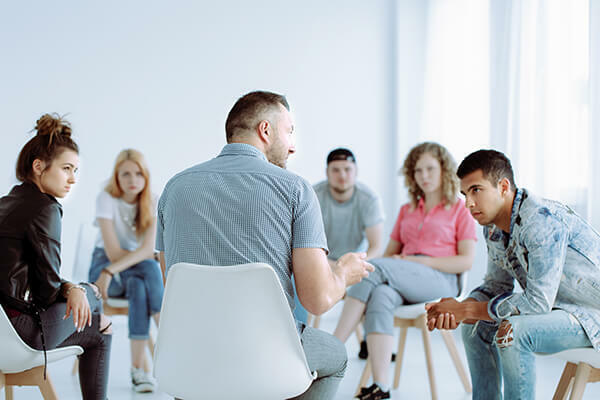 I’m not making an emotional connection and I didn’t have the right strategy,” to “I’m using these stories very strategically.” They have to be a shrink-wrap fit for the people in the room and address their pain with the right stories. It’s not just telling a story, it’s to tell the right story with the right point, for the right situation, with the right call to action. That’s how it works. It’s so important, Doug, that our audience gets this concept of a story has to end with a call to action. You flew by in which you said was a phrase that pays. I want to call that out because that’s a critical concept of storytelling. You start off knowing that you’re going to deliver the phrase that pays that particular call to action that you’re asking people to take. You have to go through the process of leading people to that place where they can hear and are willing to take action on the phrase that pays. That’s brilliant. You’re telling me a story about going to Hawaii. I have never been to Hawaii. It’s going to be a metaphor, but the minute you start telling me a story about Hawaii and it’s well-crafted, I am immediately intrigued. I want that word intrigued to be part of everybody’s consciousness from now on. If you do not intrigue people, draw them in and confuse them, throw them a curve ball. In other words, disrupt their pattern of awareness. You do something confusing and unpredictable. You grabbed their attention because they can’t tell where you’re going. You start telling this story about Hawaii and your vacation to Hawaii, taking your family there and having delayed flights. Losing your luggage and having all of these different resources and figuring things out when you get there. Going through all this change because things didn’t work according to plan. This becomes a metaphor for what’s going on in the organization. There are so many ideas there. I want to stop and unpack some of those. First of all, this idea of using intrigue at the open to confuse and disrupt, which causes them to go, “What’s going on here? I’m a little offset. I don’t know what’s going on?” To hook them in is brilliant. A lot of people are resistant to taking that particular approach. Obviously, you can’t let that state be there for too long or people are going to disconnect. To confuse and say, “What are you talking about? Hang on.” To end with an emotional hook like, “Pack your bags.” A lot of our readers could use the pack your bags metaphor for leading their team through change. Here’s an analogy. I use analogies a lot. I use stories that make metaphorical connections or analogous connections. When you are going to go to a new location, you’re going to drive to a restaurant that you’ve never been to. You’ve got a business meeting across town, but you’ve never been to that building. You pull out your phone, you pop up the app for the maps, your Google Maps or Apple Maps or whatever. How many addresses do you put into the search box before you put go to get to that address? All that I could think of is one. Disruptive Stories: Doing something confusing and unpredictable grabs people’s attention because they can’t tell where you’re going. The problem with most people is they don’t know when they start telling a story what that address is and that address that you would put into the GPS, that’s your phrase that pays. Before you start telling a story, you need to have in your mind, “What is that phrase that pays that I’m driving to through the story?” The challenge most people have is they don’t know what the point of the story is. They start telling a story. They get to the end of it as if they put in three addresses at the end. They’re going in three different directions with the story. No. Each story makes one and only one clear and concise point like pack your bags, “Here we go, folks, pack your bags.” Everybody gets engaged by the story, but what they remember is pack your bags, “I need to pack my bags,” and it’s a metaphor. 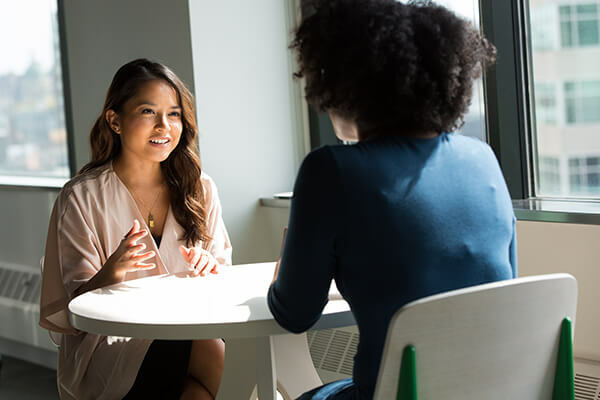 People at the end of the story when they hear pack their bags, it’s like, “Oh.” Literally what I teach is how can a C-Suite executive, a leader, a salesperson cause the person they’re talking to at the end of the story to go, “Now, I get it. Now, I see where you’re coming from.” They’re literally saying, “I see where you’re coming from,” because they watched the movie of the story in their mind as you’re telling the story. It’s visual. It’s auditory. It’s kinesthetic. It’s heart, mind, soul, logical and linear, creative and disruptive. That is how we do it. One of the things I wanted to reinforce is when you talk about how people make decisions based on emotion. That emotion has to do with their vision of their own identity or the identity they’re trying to take on. Logic has nothing to do with identity. The easiest way to explain that is to think about sports fans. If you think about it, a logical sports fan would follow a team and root for a team that wins, but they don’t. They root for the team that’s part of their identity. That identity can be established by the fact that they went to school there or their parents took them to games or grandfather took them to games when they were a kid. Whatever it happens to be, there is an identity. They get to the point where they even refuse to wear the logo of a competing team. To me, a logical guy, why not root for a team that’s going to make you happy most games versus piss you off most games? That’s not how it works. Identity is a critical component of that. By telling a story that your audience can identify, that allows them to hook into their identity and then make a pivot to take them where you want to go, which is your phrase that pays. It’s brilliant that you show people that you start with a phrase that pays. What’s the single point? One point only, you said. Build the story with that end destination in mind. Run a clear and concise point for a story. You’ve got to know where you’re going. One of the things that people are happy to discover when I work with them is I’ve got this formula, The Nine Steps of Story Structure. I’ve got this construct called The Phrase That Pays. Basically, I have storytelling instructions. I allow people to take what seems to be an art form, this storytelling thing that some people are naturally good storytellers and other people aren’t. It’s like, “No.” If you understand through my methodology how to choose craft and deliver a story with the call to action at the end, everybody can be a better storyteller. Everybody can be engaging. Every leader can be the leader that everyone remembers for years. One out of 100 leaders is a naturally good storyteller. The other 99 can benefit from the process. It’s interesting that you pointed out that the best leaders are great storytellers. They can become that. Most of the leaders that I have worked with over the years are not naturally good at it. They’re naturally good at doing the business of the job of being a C-Suite leader. Many of them are very logical and linear and left-brain. They would love to be more emotive. They haven’t had that training because what is the training in business school? It’s certainly not to be a storyteller. This is an add-on that comes later on in the development of your career where you say, “I’ve gotten this far. I’m in the C-Suite but I don’t know how to engage, persuade, inspire and motivate.” I’m in the business of teaching leaders how to inspire, motivate and change hearts and minds. That’s what story does. It’s like the most amazing Swiss army knife tool. If you think of a Swiss army knife, it’s got all of these different blades that do all these different things. There are stories for marketing. There are different stories for leadership to inspire. There’s a very different story for the sales conversation. There’s a different story for internal communication versus external communication. There’s a story that you use when you’re speaking at a community group. There is a different story when you’re talking to the Board of Directors. It’s not a one size fits all, but it’s like a Swiss army knife. If you’ve got this tool, this storytelling tool and this understanding of how it works, you can adapt it into all of these different situations. It doesn’t matter what room you walk into, you walk in with this confidence knowing, I have got a story that is going to change hearts and minds and bring people to my point of view. Disruptive Stories: If you’ve got this storytelling tool and this understanding of how it works, you can adapt it into different situations. Are you willing to share with us those nine steps, Doug? At the end of this, I’m going to give you a link where you can send an email to me and have a Nine Steps article. The Nine Steps are simply, number one, set the scene. Set the scene as a data dump, time and place. Step two is to introduce the characters. In introducing the characters in your story and the characters show up where the characters show up. What I mean by introduce is you don’t just say my boss or my sister. You give them some adjectives, some descriptors. Mark, you are a unique human being, you’re not a guy. I’m a unique human being. Every C-Suite person here is a unique human being. We need some adjectives to describe them so the reader can visualize almost with a holographic image this character that’s in the story. They have to have a personality. They have to have a style. They have to have color. They have to be three-dimensional, not just, “My boss,” because, “My boss,” doesn’t say anything about anything or my executive secretary. It doesn’t say that this is a unique human being. Number three is begin the journey. The journey is the task, the goal. It’s going to Hawaii on vacation. It’s speaking at a regional conference. It’s going to sit down and have a sales conversation with a prospect. It’s the task. It’s the goal. It’s the thing you’re trying to accomplish. Step four is to encounter the obstacle. All stories need an obstacle. They need a crisis. They need some friction. They need a misunderstanding, a failure, a mistake, a small disaster. It needs something that causes there to be friction or tension in the story. Step nine is to restate the point, “My friends, we’re about to enter into a journey where things are going to get a little bit choppy but pack your bags.” I restate the point by saying, “Pack your bags.” In seven I say, “What I learned is to pack your bags.” Step eight, “How about you? Have you ever had a journey that didn’t work out according to plan?” Step nine, “All my friends, pack your bags because here we go.” In the nine steps of story structure, you’ve got a sequence that allows you to understand there’s a sequence that I can follow. There are certain data and certain information that goes in a certain sequence. If I use that sequence, it will work out. Don’t screw it up and do it out of sequence. A lot of people say, “Doug, I saw this movie where it started at the end. It went back to the beginning and went back and forth through time.” I say, “Yes, they’ve got a $4 million budget, cinematographers and actors in there.” You and I are standing all by ourselves in front of an audience. Let’s keep it simple. None of us has the Steven Spielberg budget and creativity. Let’s keep it easy for our audience and keep it easy for ourselves. That’s a simple formula that our reader can use. At the end of the show, we’ll give them a place where they can download that article. You’re very kind and generous in sharing your experience of creating stories in these nine steps. You’ve talked about one of the key problems is doing more than one point in a story. What other challenges do you see when people attempt to tell stories that fall flat? The lack of connection to the event in itself. Let’s say I’m telling a story about flying across country on the same day that I’m giving a keynote speech. I decided like an idiot to fly on the same day as an after-dinner keynote speech. All of a sudden I get into Chicago’s O’Hare Airport. What happens when you get to Chicago’s O’Hare Airport? Disruptive Stories: For a leader if you’re not trusted, if you don’t reveal a little of your humanity, people won’t want to follow you. If it’s the winter time, you get stuck. It’s the end of the road for flights, you get in there and it’s delayed. I had this flight where I was flying into O’Hare Airport to get a connection down to Kansas City for an after dinner keynote speech. I’m flying on the same day and it was delayed. If I say very logically without any emotion that the flights got delayed and I don’t have any tension in my body. I don’t have any tension in my voice. I’m not like, “Delayed? Oh my God. No, no, no. Come on. I need to get this flight.” If there isn’t any emotional connection to the friction in the story, if there isn’t anything in the storyteller’s body language and voice and energy, that says they experienced this. This isn’t a fact that they were in O’Hare and things got delayed. No, they’re replaying a little bit of the tension and how frustrating it was. That’s the emotional connection. I come from an acting background, so I’m very emotive. I get into it. I do all this. When I’m working with an executive or a leader, salespeople, I say, “What were you feeling at that moment when things went wrong in your store?” They go, “I was frustrated. I was angry. I was on the phone with people. I was raising my voice with a customer service representative. I go, “Could I see that please?” Can I see a little bit of that in your presentation of the story?” They go, “I’m supposed to do that?” I said, “Yes, if you do that, then I’ll feel it.” You’ve got to go first. If you don’t go there, I don’t go there. The listener is literally having what’s called a mirror neuron response. I don’t know if you’re familiar with this. You probably are because you and I study all this stuff, but a lot of people have probably never heard of this. If you’ve ever gone to a movie and you cried during the emotional scene, you’re not crying for the actors in the movie. You’re crying for your own pain. That is a similar pain to what you’re seeing on the screen. If you get nervous during the tense moments, that’s a mirror neuron response. In your brain, mirror neurons firing causing you to experience what you’re watching. If you get to that tense moment in your story and you say it, there’s no mirror neuron response. The audience listens to it as if that was interesting that that happened to you. If you act it out, if you feel it, if you express it, if you replay a little bit of that anxiety, the audience feels their anxiety at the same time. Now, you have an emotional connection. It’s a very technical process of being able to get people to understand you. You don’t stand outside the story and talk about it like it happened to somebody else. No, it did happen to you. It was frustrating. It made you mad. Get a little frustrated and get a little mad in the story and I will feel it and everyone will remember your story for the next twenty years. I think that’s such a critical point. Everyone, you’ve got to get this in your brain. Doug called out something that is critical for you to understand. If you want to make an emotional connection with your audience, you have to be emotionally connected to your story and you have to show it. The only way storytelling works is when we deliver a story with an emotional connection. Otherwise, it’s logical and you’ve lost the entire reason why you tell a story. Stories are always about emotional connections. That’s why I asked people to tell a personal story and then make a business point at the end. Go off on a metaphorical journey. If you go off on a metaphorical journey and telling me a story about going to Hawaii or dropping the turkey in the kitchen floor when you pulled it out of the oven at Thanksgiving, you’re telling me that story and I relate to it. I’m also wondering, “What does this have to do with what’s going on in my organization?” You know you’re going to come back around to a phrase that pays. Tell me a personal story. Reveal who you are to me. Don’t just be the suit. Don’t just be the role. Be a human being like me who has had challenges and obstacles in your life. Then I will relate to you, I will like you and then I will trust you. My brain will release oxytocin, which will cause me to feel good about you and to trust you. For a leader, if you’re not trusted, if you don’t reveal a little of your humanity, people won’t want to follow you. In fact, in my model, I’ve understood 40% of our success is the relationship we generate, 50% is the motivation of the person we’re working with. The story helps round up that motivation. That’s for inspiration and motivation, which are two different emotions. One is internal and one is external. It depends on where they are at Maslow’s hierarchy of needs, which the one you use. That said, only 10% is the change that you want to make. You have to create that relationship. Stories are a great way of doing that. It’s always relationship first and motivation second. If they don’t believe you, they don’t trust you. If they don’t think that you’re acting in their best interests, their motivation is going to take them in a different direction. There are lots of extraordinary points. There are lots of action-packed ideas in this episode. Doug, how does our audience get ahold of you? How do they get ahold of the Nine Steps Story Formula? Also, I want you to share a moment about what you do with helping people produce TED Talks because I have to admit this. I am a client of yours in preparing for a TED Talk. I’ve got a webinar coming up on the Ten Things You Need to Know About TED Talks. There’s a number of reasons why this is an important model of speaking. Nowadays, people are starting to look at TED Talks and realize somebody does get up and in ten minutes they did a lot. Somebody did an entire speech in twelve minutes where I got value. That’s interesting. Maybe we only need to hire people to do ten or twelve minutes, or at least our leaders need to understand, if you’ve only got ten minutes, how can you use that ten or twelve minutes really well? How can you like make an impact in ten or twelve minutes? In my process of working with TEDx Tucson as the speaker coach and curator helping to choose speakers and also having given two TED talks, I’ve come to realize it is a real hybrid. You and I can go out and give a keynote for 60 minutes, Mark. We can do three hours or six hours or a couple of days of training, but when you’ve only got ten minutes and you need to have a beginning, a middle, an end and a call to action. It has to be brilliantly crafted and you can’t go over ten minutes, it requires an incredible amount of discipline. Both the webinar that’s going to take place in February on Ten Things You Need to Know About The TED Talks and The Nine Steps of Story Structure. The information is on my website, www.Storytelling-In-Business.com. For the Nine Steps articles, send an email to Deborah@DougStevenson.com and in the subject line, put Nine Steps Article. She will send you The Nine Steps article. On my website, there are a number of articles, there are videos of me and there are testimonial videos. There are articles. There’s all the information on all the programs that I do and all the clients that I’ve worked with. There is enough information on there that you can read articles, go onto my blog and read. There are hundreds of articles on there over the years to get more information on advanced presentation skills. What I do is very different because it’s not present your information. Emotion is the fast lane to the brain. Make an emotional connection with your material. Do not put people into a content coma. It’s not a question of, “Should I use PowerPoint or shouldn’t I?” It’s a question of, “Do you understand how to tell a story with a PowerPoint deck rather than data down bullet points and really bad PowerPoint?” Do things differently, understand the dynamic of audience engagement and connection so that you can inspire and motivate. Disruptive Stories: Make an emotional connection with your material. Do not put people into a content coma. Doug, you’ve got lots of online learning. You do workshops. I have owned a number of your products that you’ve created around creating keynotes. I’m honored to be a co-author of one of your very first products decades ago. It’s been a pleasure to be a part of your life and you are part of my life and watching our growth and expansion over the years. When I met you, I was starting to be a speaker and here I am years later having spoken in eighteen countries and develop books, audios and keynotes for Fortune 100 companies. It’s been an amazing ride. It’s quite a story. Thanks for taking it with me. That is a great conversation. 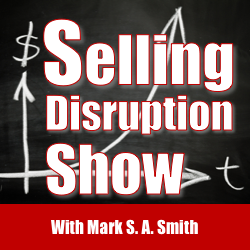 Thanks so much, Doug, for being with us here on the Selling Disruption Show. It’s my pleasure, Mark. Thanks. Doug Stevenson is the founder and president of Story Theater International, a speaking, training and consulting company, now based in Tucson, Arizona. His company trains thousands of professionals and executives each year, for clients that include Microsoft, Amgen, Bayer, Caterpillar, Oracle, Volkswagen, Hewlett Packard, Maytag, Super 8 Motels and others. His association clients include The National Education Association, The American Medical Association, The National Association of Realtors, The Wisconsin Municipal League, The Cattleman’s Beef Association and others. He has spoken, trained and coached in the US, Canada, Australia, Austria, Costa Rica, Colombia, Denmark, England, Germany, Ireland, Japan, Malaysia, Panama, Portugal, Singapore, Spain, Switzerland and The Netherlands. 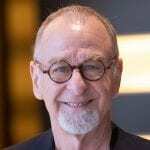 Tens of thousands of people from four continents have studied with Doug in his Story Theater, Inspirational Leadership and Presentation Skills workshops and train-the-trainer programs. Doug used to believe he was destined to be the next Bob Hope. That was back in the 1960’s when he was a child making up his mind about who he wanted to be. He dedicated 20 years of his life to becoming a successful actor, only to realize that his destiny was much greater and far more meaningful than being a movie star. Life has a way of teaching us who we are, doesn’t it? Now, having spoken to audiences all over the world, and having coached and trained countless individuals on how to become amazing speakers, trainers and leaders – he’s discovered that he isn’t supposed to act like Bob Hope. His gift is the ability to give people hope. Doug is the creator of The Story Theater Method for strategic storytelling in business and author of the book by the same name. He is also the creator of The How to Write and Deliver a Dynamite Speech System, and the Next Level Storytelling Video eLearning Series. He not only presents transformational speeches, he follows them by analyzing what he has just done. Not only does he make you laugh and cry, he teaches you how he does it. It’s as if he’s a magician who does a wonderful magic trick, and then takes you behind the curtain and shows you all of his secrets. What Doug Stevenson does is not magic. You can learn how to be a transformational speaker using his methods and technology. You can learn how to use acting, storytelling and drama techniques to connect with people at a deeper level. His motto? Emotion is the fast lane to the brain. The process? Speak from your head with your heart wide open. On the practical side, Doug knows marketing, sales and customer service because he has owned a number of businesses including a real estate brokerage. He learned his lessons in leadership while serving on the board of directors and then as the president of a state association. And finally, Doug learned how to embrace diversity by speaking in different countries to people of different cultures. 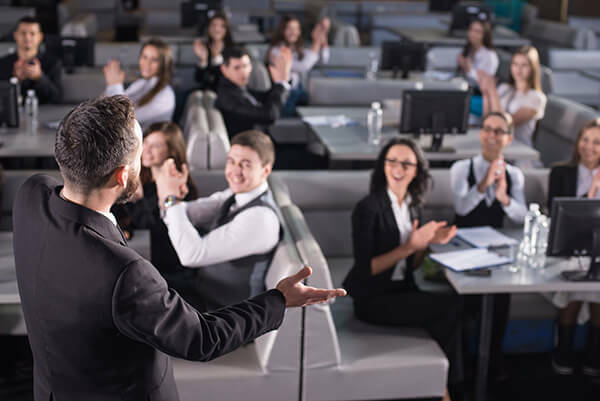 Doug’s keynotes and training programs are like watching a business presentation as theatrical experience. He doesn’t just give a speech. He takes you on an intellectually stimulating and emotionally moving journey into your own magnificence. When Doug is done working his magic with you, you know more, understand more and can do more to change the world you live in. In the end, it’s always comes back to the beginning. It’s about hope. In addition, he conducts Story Theater Retreats – his 2 -day intensives for four students. He has contributed a monthly column entitled Talk Your Walk for the Denver Business Journal and is the author of twelve audio and DVD programs including the Story Theater Audio Six Pack.